Around here everyone dresses their skirt steaks with a dollop of Chimichurri. If you’ve never had it, you’re definitely missing out. Chimichurri is a steak condiment originally from Argentina and made from parsley, olive oil, garlic, salt, lemon juice, red wine vinegar and red pepper flakes. It’s rich and herbal, tangy and a little spicy. It’s the perfect accompaniment for grilled beef. Since Chimichurri also resembles pesto, I figured it would make a great pasta sauce. And I was right. I grilled a skirt steak and some big, purple asparagus and tossed them with Rigatoni and a fresh batch of Chimichurri. I loved the grilled flavors with the pasta and garlicky sauce. This is the perfect meal to eat outdoors when the weather is nice and you have a big frosty beer or chilly glass of wine. Is it the weekend yet? Refrigerate the leftover Chimichurri for up to 3 weeks. Start by making the Chimichurri. Place all of the ingredients in a blender or food processor and pulse until all large pieces of parsley and garlic are gone. If you don’t have a blender, chop the garlic and parsley finely, then whisk with the remaining ingredients. Set aside. Heat your grill to medium-high and sprinkle the steak with 1 tsp. salt. Once the grill is hot, place the steak and asparagus on it. Turn the asparagus often, ensuring it doesn’t burn. Remove it when it’s tender, but still crisp (time depends on how thick your asparagus is, about 5 – 8 minutes). Cook the steak to your desired done-ness, then remove and let sit for 5 minutes. Slice the steak into bite-sized pieces and cut the asparagus into 1-inch pieces. While you’re grilling, set a large pot of water to boil over high heat. Once it comes to a boil, salt it thoroughly and add the rigatoni. Cook until al dente, then drain and return to pot. Toss the pasta with half the amount of Chimichurri until well coated. Toss in the steak and asparagus and serve. I love finding out new says to use chimichurri! The last thing I came up with was mixing it with tuna. 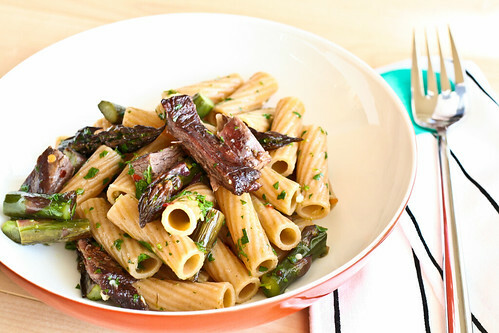 This pasta, steak and asparagus mix is simply brilliant. Thanks!! Chimichurri as pesto? Brilliant. I love everything in that bowl! Chimichurri is the best! I’m with Melissa, everything in that bowl is amazing. Now this is my type of meal!!!. For those of you that have never had “Chimi, Chimichurri” I’m telling you it’s awesome. It’s so good that if you put it on the boot of a soldier that just finished 3 months of boot camp without changing his socks, you would ask for his other boot. That good!!! This sounds great! I love the idea of using chimichurri as pasta sauce. Melissa, we lived in Miami for many years (moved 2 years ago and really miss it). We love Cuban food. I found you on the SE site and love your recipes. I just made this last night – it was fantastic!! I added a red pepper and 2 portobello mushroom caps to the grill pan too, since I didn’t have enough skirt steak in my freezer. I replaced one of the tbsp of lemon juice with lime juice, and added some lemon and lime zest to the chimicurri. I am definitely going to make this again!!! I’m making this dish this week – it looks and sounds wonderful. Never heard of chimichurri, and I can’t wait! What a fabulous recipe! Fresh ingredients is the only way to go. Steak, pasta and vegetables never looked so good. Thanks for sharing. This looks amazing! I’m going to make it for a girls night this weekend! Something different and fresh, can’t wait! Thank you!! This was so good – I loved it. I love it, my husband loves it! Very easy to prepare. This will be a regular in our family. Thanks for sharing! I saw this recipe recently and thought it was such a great idea! Sadly, I’ve only had chimichurri sauce on fajitas at Chili’s. They make theirs with cilantro so it’s not authentic but it sure tastes GREAT! I made this tonight without the steak because we don’t do meat. Used whole wheat rotini and the shape held the chopped up parsley perfectly. So easy and good! Thanks for the fantastic idea. This was SO SO SO good! I will for sure make again! Yum, this looks fantastic! Great flavors – I so need to try this!